More than 300 secondary schools in England are under-performing, official figures suggest. New data shows that 11.6% of state-funded mainstream schools – in total 346 – fell below the Government’s minimum standards in 2018. In 2017, 365 schools fell below the floor standard, but the figures are not directly comparable. This is because the latest data does not apply to University Technical Colleges (UTCSs) or further education colleges with 14-16 provision or studio schools. Schools fall below the Government’s performance threshold if pupils fail to make enough progress across eight subjects – with particular weight given to English and maths. 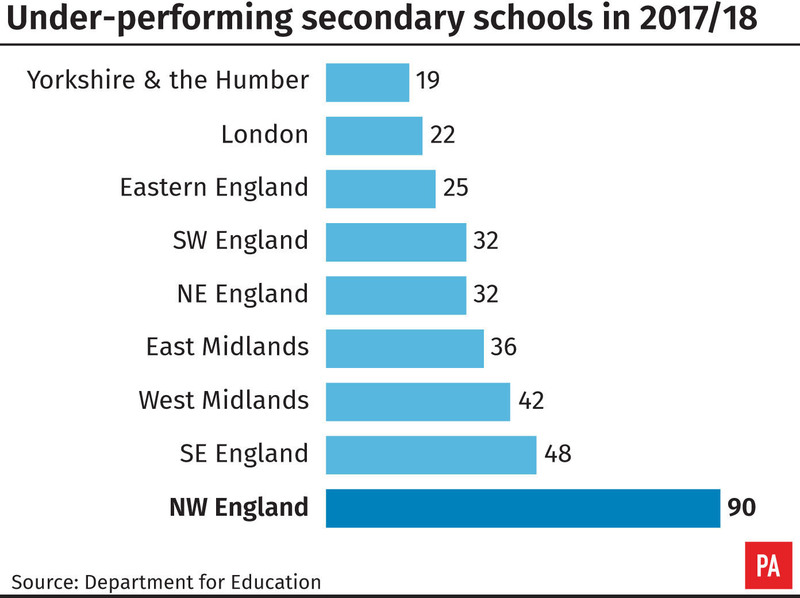 Thursday’s data, which covers every secondary in England, shows Yorkshire and Humber has the lowest proportion of under-performing schools, while the North West had the highest. The figures also show the proportion of pupils achieving a grade 5 or above at GCSE in both English and maths has increased, from 42.6% last year to 43.3% this year. The Department for Education data further reveals that 95.5% of pupils are now entering EBacc science at GCSE, up from 63.2% in 2010. And the number of pupils taking maths and science at A Level has increased, including a rise of around 7% in the number of girls taking at least one of these subjects. The attainment gap between disadvantaged pupils and others increased slightly, rising by 0.6% between 2017 and 2018. “It’s been clear for some time that standards are rising in our schools and today’s data underlines the role academies and free schools are playing in that improvement, with progress above the national average and impressive outcomes for disadvantaged pupils. “Also vital to rising standards is the increasing number of pupils entering the EBacc.